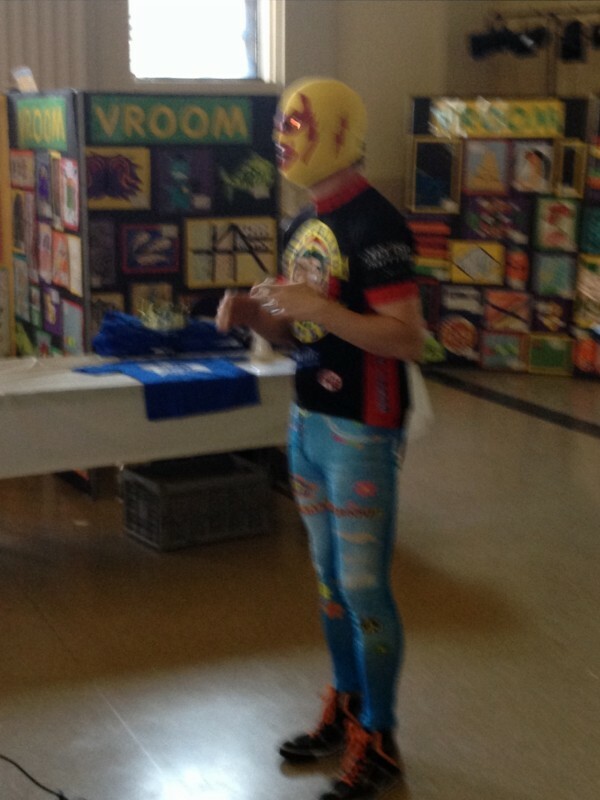 Not the greatest picture of Captain Bayonne but never the less – he showed up and delivered inspiration! 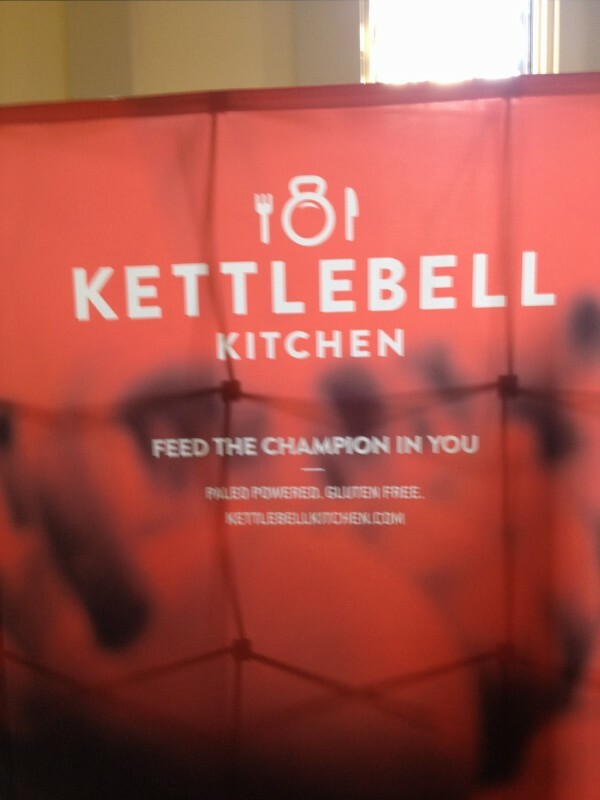 Kettle Bell Kitchen is a Paleo Food Delivery service that is exploding onto the scene. At the current moment the only drop off spot in Bayonne is at Crossfit Bayonne. We are looking to change this. They sampled a salad made with a coconut cream dressing as well as buffalo chicken and grass-fed beef and plantain chili. Barbara emotionally spoke on how her grandson’s organ donation saved another child’s life. After finding out that my patient Alan was saved by a heart transplant I quickly became a organ donor. Maris served 2 jobs. 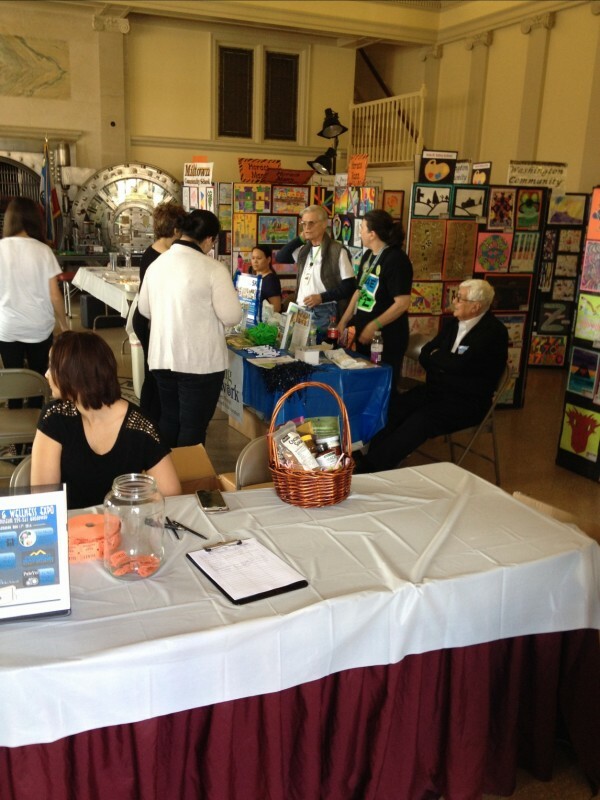 She helped out at our super foods table and she scanned people with the insight subluxation station. Maris is in Chiropractic school and to see her explain Chiropractic to the public was a thrill. 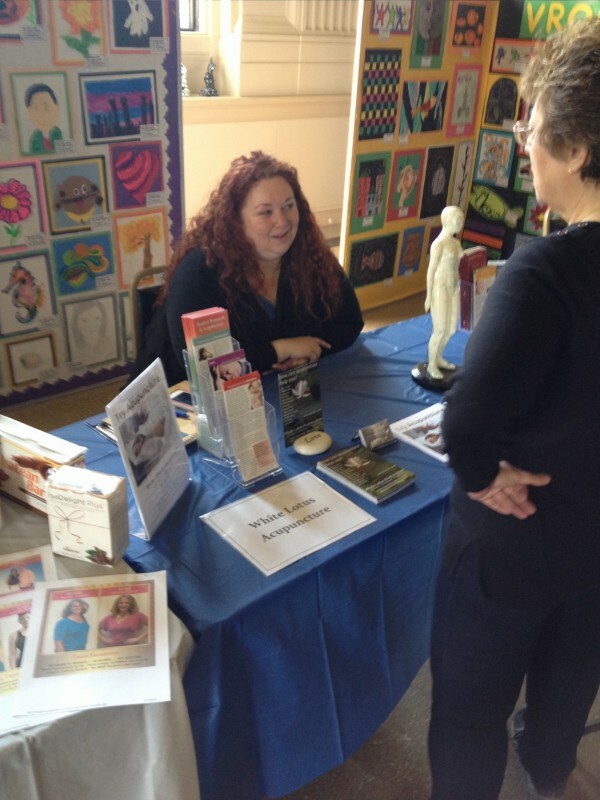 My Acupuncturist Carla from White Lotus Acupuncture was in attendance as well. 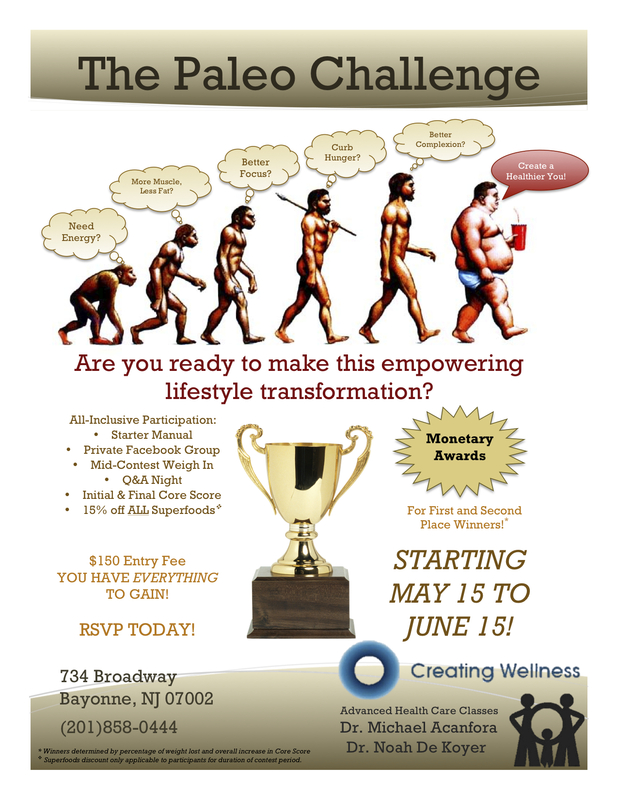 Other participants include – Cross Fit Bayonne, Kettle Bell Kitchen, Isogenix, Family Massage Therapy, White Lotus Acupuncture, NJ Sharing Network, Chiropractic, and AllFit Yoga Studio. Special guest appearance by Captain Bayonne. 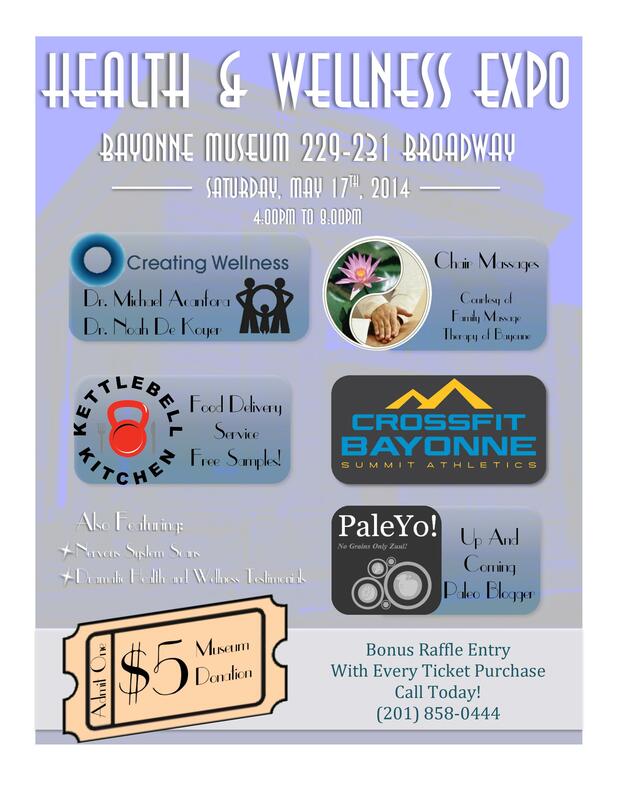 To attend you can call the office at 201-437-0033 or just show up – for your $5 entry fee you are entered into a raffle for a Super Foods basket and monies collected will be transferred to the Bayonne Museum as a donation. 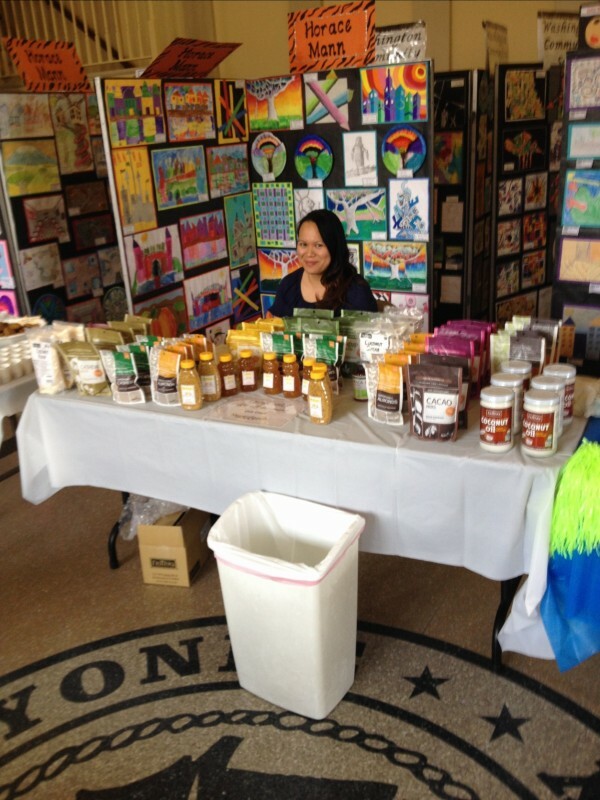 **New this year with be super food samples and grass fed whey protein shakes! The second facility, Clear View Sanitarium, was established in 1926. In 1951, Clear View was acquired by the Palmer School of Chiropractic. Dr. W. Heath Quigley, who directed the sanitarium, described the clinical protocol: “Each day, each patient was examined. If the clinician interpreted their diagnostic analysis to indicate nerve impingement, the patient was adjusted.” Quigley reported that the rooms were “sunny and bright,” and that meals included “large servings of fresh vegetables…from a garden.” Unfortunately, both institutions closed (Forest Park in 1959 and Clear View in 1961) in large measure because of third party pay issues. Insurance companies often refused to pay the costs of care. The 1970s saw a renewed interest in chiropractic care and mental health issues. In 1973, Dr. Herman S. Schwartz, a chiropractor, published a book titled “Mental Health and Chiropractic: A Multidisciplinary Approach.”  In 1949, Dr. Schwartz had published a preliminary report of 350 patients afflicted with a “nervous or mental disorder” and reported that the majority of them showed improvement under Chiropractic care. Interest in this field continues. Several authors have reviewed the role of chiropractic care in children with learning and behavioral impairments. Blanks, Schuster and Dobson  published the results of a retrospective assessment of subluxation based chiropractic care on self related health, wellness and quality of life. After surveying 2,818 respondents in 156 chiropractic practices, a strong connection was found between persons receiving Chiropractic care and self reported improvement in health, wellness and quality of life. 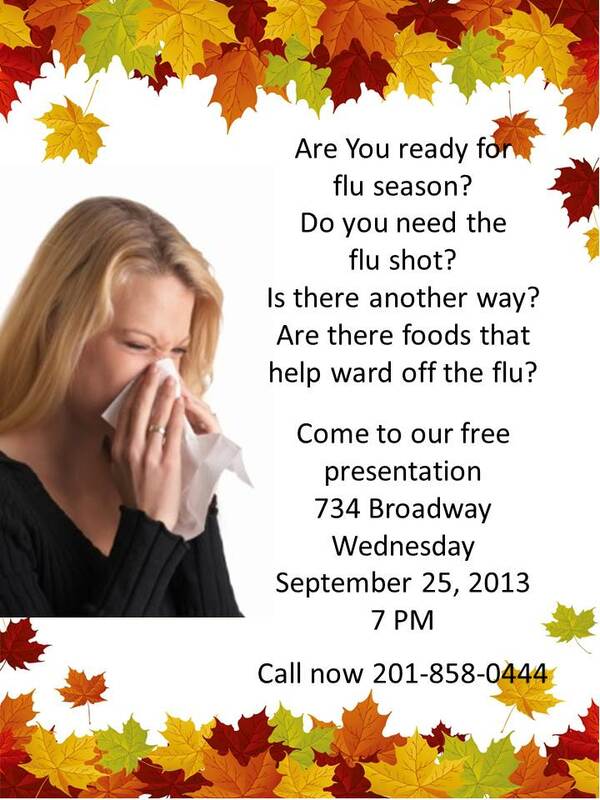 A thank you must go out to Dr. Dan Yachter and Elevation Health for putting this information together. **If you have any questions please don’t hesitate to contact me at 201-437-0033 or at ndekoyer@hotmail.com. Thank you for reading – Dr. Noah De Koyer. 2. Schwartz HS: “Mental Health and chiropractic: A Multidisciplinary Approach.” Sessions Publishers. New York, 1973. 4.Blanks RHI, Schuster TL, Dobson M: “A retrospective assessment of Network care using a survey of selfreported health, wellness and quality of life.” Journal of Vertebral Subluxation Research 1997;1(4):15. We all need nutritional support on some level. Depending on your genetics, how well your digestive system works, and the quality of your food choices will determine what kinds of supplements are best for you. It is our belief that if you are eating a Paleo Template Diet with appropriate sun exposure your need for these products should be minimal. Especially if you are consuming organ meats, bone broth, and a wide compliment of fresh vegetables. However, there are a few supplements that we feel are necessary even in the best of diets and this is why we designed the Paleo Pack. So you may be wondering what is in the Paleo Pack. Each packet includes 6 capsules and 2 softgels. 2 capsules (2,000 ius) of Vit. D3, 2 capsules (300 mg) of Magnesium bisglycinate chelate, 2 softgels (2,000 mg) of Marine Fish Oil Concentrate including 10 ius of Vit. 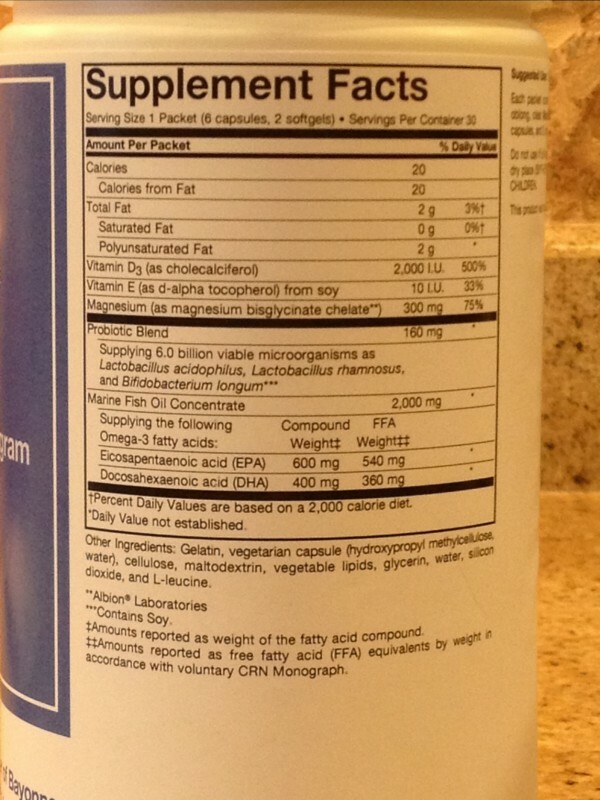 E, and 2 capsules of a Probiotic Blend supplying 6 billion cfus of beneficial bacteria. Why Vit. D3 – first and foremost many people are deficient – Vit. D3 has roles in calcium metabolism, bone health, and many other physiologic processes – Vit. D receptors are found in the colon, prostate, breast, ovary, and many other tissues, it is anti-inflammatory, boosts immune function, and up regulates many many genes. Why Magnesium Chelate – it is a cofactor in more than 300 enzymes, extremely important for cardiac function, energy metabolism, neurochemical transmission, and bone formation. The chelate form is absorbed and utilized much easier than other forms such as carbonate or sulfate. Other than cacao and a few other foods magnesium is difficult to get from food alone. Why Marine Fish Oil – high potency DHA and EPA will help your body reduce inflammation and to feed your brain and nervous system with the fats it needs to function at high levels. Omega 3s support many physiological processes related to immune function, lipoprotein metabolism, brain function, and mood regulation. A small amount of natural Vit. E is added to maintain freshness and retard lipid peroxidation. Why Probioitics – 6 billion plus cfus of bifidobacter and lactobacillus to help reestablish your healthy balance beneficial bacteria, boost your immune system, and improve your gut health and digestion. Microencapsulation is used to help protect the microorganisms from destruction by stomach acid to ensure there viability and improve shelf life. 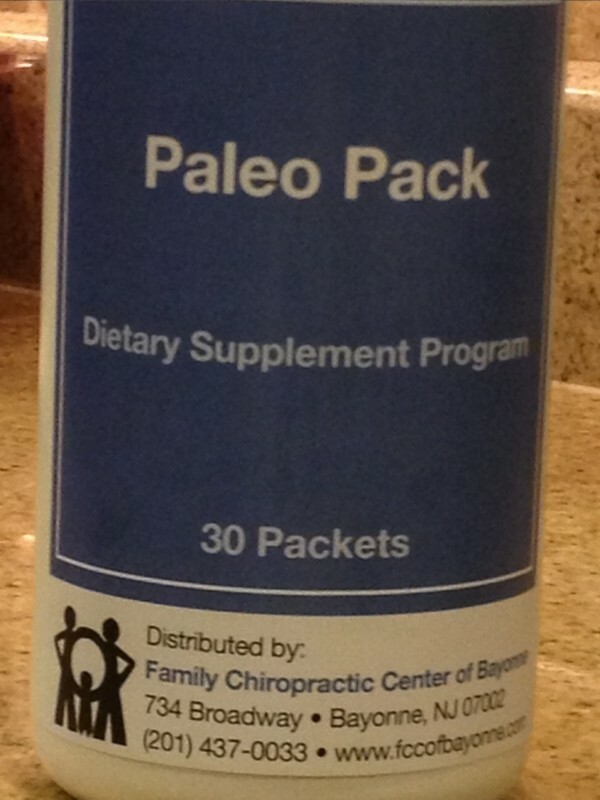 The cost of the 30 Day Paleo Pack is $45. Just some recent testimonials (names deleted) I received that I had to share…………. 1. Morbidly obese, suffering from arthritis with further concerns regarding cancer and diabetes and without a plan or direction regarding supplementation and healthier eating…..NO MORE! Dr. Noah De Koyer provides chiropractic adjustments to deal with my subluxations (misaligned spine), structured and informative FREE lectures ( with subjects from ADD/ADHD, arthritis, fermentation, organic foods, recipes, smoothies, super foods, supplements, to wildly held myths regarding health) & the literature and sites for further follow-up; arranges super outings for walks & visits to cheese, wine, honey and meat farms and apple orchards; and most importantly takes the time to listen, evaluate and propose suggestions and courses of action for wellness, nutrition and lifestyle strategies. Dr Noah is all about helping to create the well balanced plan for a healthier self. My successes to date: a 34 lb weight loss, a more educated self making healthier food & supplement choices and a spring to my step. I still have a way to go however the journey is that much less painful and full of smiles. Thank you Dr. Noah & Family Chiropractic Center of Bayonne. 2. I came across the Family Chiropractic Center of Bayonne through a desperate Google search trying to deal with my back pain. What I found was a group of people who care about the health and happiness of my family. Outside of helping me with my back pain and teaching me the importance of chiropractic care, Dr. Noah has become a partner in my path to wellness. When I got to my wits end with my back pain I was also fed up with my digestive health, it just so happened that Dr. Noah was on the same journey. He is extremely knowledgeable and passionate about making everyone that walks into the practice healthier than they were before. At 30 I feel happier and healthier than ever have and I can attribute a lot of that to Dr. Noah. I trust his advice and appreciate all that he has done for me and my family. 3. Two and a half months ago I was 265 lbs taking blood pressure and cholesterol medication, suffering from lung disease that prevented me from walking up a flight of stairs without losing my breath let alone working out to get in shape. My seasonal allergies were killing me. Then I visited Dr. Noah and he told me about The Paleo Diet. I read the books and it seemed to make sense to me. In the ensuing months I have lost 28 pounds, been taken off blood pressure and cholesterol medications due to my great blood work and I am jogging again, my allergies are all but gone. In general for the first time in years I can say I feel great. 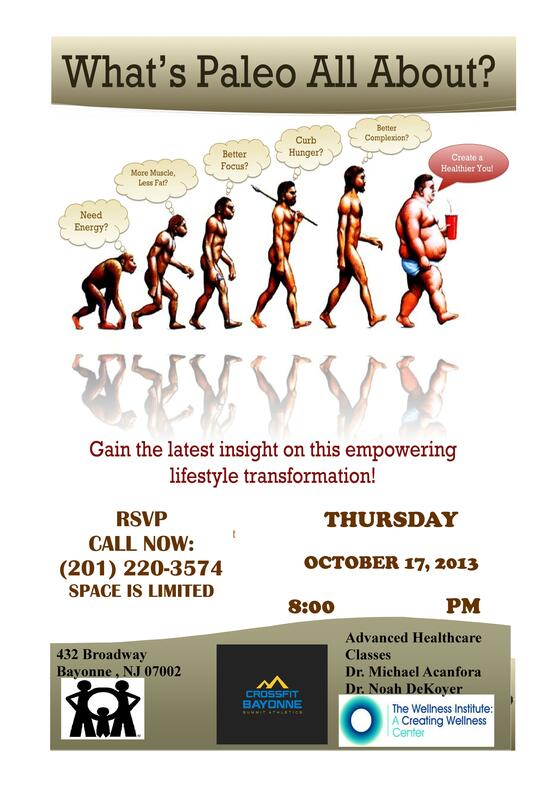 To say Paleo and Dr. Noah have changed my life is an understatement. 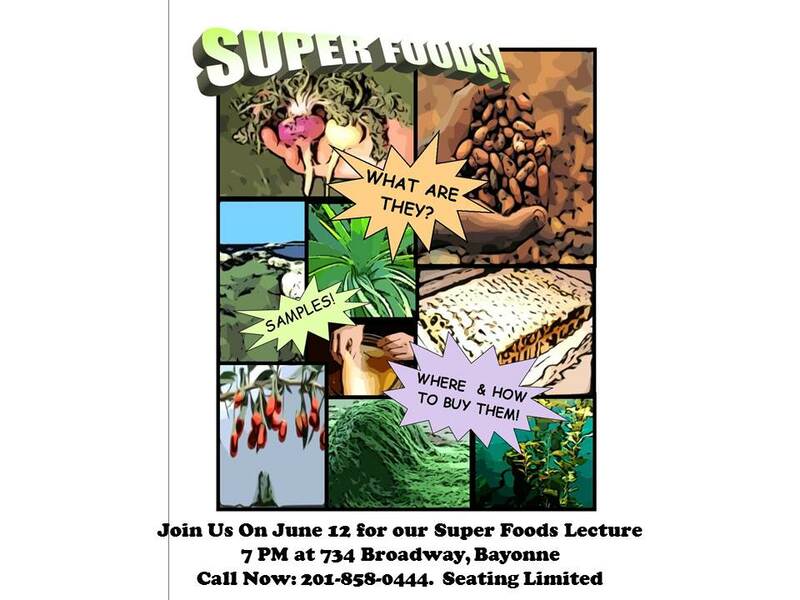 SuperFoods 2.0 – This Wednesday 7:00PM – 734 Broadway Bayonne NJ 07002 – The night of the presentation all SuperFoods are 15% Off! This Wednesday at the Office! This is our monthly sale! These cashews are the most delicious sweet nuts I have ever tasted! If you are interested in participating please fill out this contact form. The initial weigh in, Core Score, and manual pick up is May 15th from 10:00 am to 8:00 pm. The Contest runs from May 15th to June 15th. YOU HAVE SO MUCH TO GAIN! This high-protein soup is packed with benefits, thanks to the addition of hemp seeds! Served with a salad it easily makes a satisfying, balanced meal. In a large soup pot, heat the coconut oil over medium-high heat. Add the onion and cook for 2 minutes. Add the garlic, carrots and celery, and cook for 3-4 minutes longer, to soften the vegetables. Add the bay leaves, peas, miso paste, and water, and stir to combine. Cover, bring to a simmer, then reduce heat to medium-low. Cook for 50-60 minutes, stirring occasionally, until peas have broken down – add additional water if needed. Add the walnuts and the hemp seeds, and adjust seasonings if desired. Serve warm, with plenty of freshly ground black pepper. Will keep for several days refrigerated.